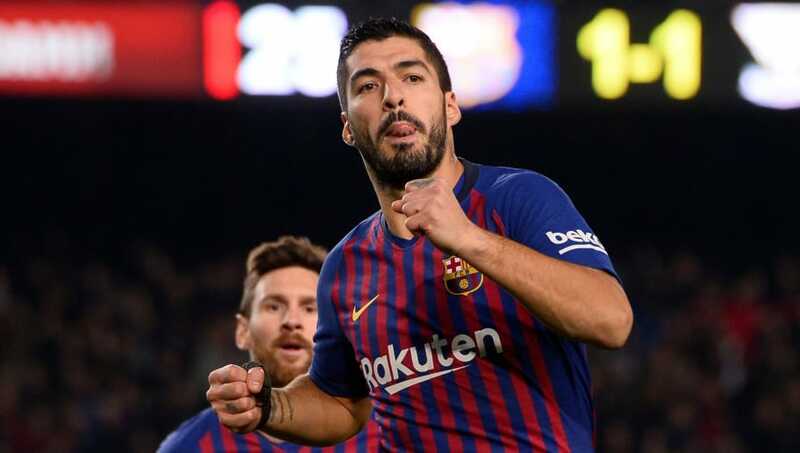 Barcelona strengthened their grip on top spot in La Liga after comfortably dispatching Leganes 3-1 on Sunday evening. ​Barcelona started the game on the front foot and took the lead midway through the first-half through Ousmane Dembele, who finished off a swift counter attack with panache. The French winger delivered the ball out wide to Jordi Alba and engineered some space in the 18-yard box, stroking the ball home with a first time finish after Alba fizzed the ball into his path. The hosts continued to dominate, but were unable to fashion any clear cut chances to double their lead before the interval - a penalty shout for a clumsy challenge on Luis Suarez aside. Against the run of play and seemingly from nowhere, Leganes were able to find an equaliser ten minutes after the restart. Middlesbrough loanee Martin Braithwaite tapped the ball home after Youssef En-Nesyri squared the ball across the box, giving Barcelona something to think about. The sides were level for just 15 minutes before Barcelona retook the lead. Lionel Messi forced a superb save from Ivan Cuellar and Suarez reacted quickest to score the rebound, clattering into Cuellar in the process. With the game entering its closing stages, Barcelona rounded off their evening with a third goal, courtesy of a very familiar source. Alba was the provider once again, this time setting up Messi who guided the ball home emphatically for his 18th league goal of the season. It's now seven league wins on the bounce for ​Barcelona, who are making light work of the league this season. Barcelona weren't necessarily at full strength for this one, exemplified by Ernesto Valverde's decision to start ​Messi on the bench, but they still possessed far too much quality for Leganes - even if they were a little blunt in the final third at times. The league title almost seems to be a certainty, barring a disaster, so the real test for the Blaugrana is likely to come when they restart their Champions League campaign next month. Starting XI: Ter-Stegen (6); Roberto (6), Pique (7), Vermaelen (6), Alba (7); Busquets (6), Alena (7), Arthur (6); Dembele (8*), Coutinho (5), Suarez (7). Substitutes: Messi (7), Rakitic (6), Malcom (5). It was a great shame to see ​Dembele hobble off in the second half, because was enjoying a stellar game up until that point and was by far the best player on the bench. He is growing in confidence in every game and his willingness to take risks and push the boundaries is starting to pay off more often than not. There is still plenty for him to improve on, but it is clear to see how far he has developed since he joined the Blaugrana at the start of the 2017/18 season. Dembele's play in the build up to that goal , the pass to Alba and that return pass has Messi written all over it..
Coutinho's situation at Barcelona is very delicate and it is clear to see that the former Liverpool man is currently lacking in confidence. He showed promising signs in the first half, but his influence diminished in the second. He slowed down plenty of attacks and made the wrong decision in the final third all too often. Barcelona will now be looking ahead to their Copa del Rey quarter final first leg tie against Sevilla on Wednesday before returning to La Liga action against Girona next Sunday.